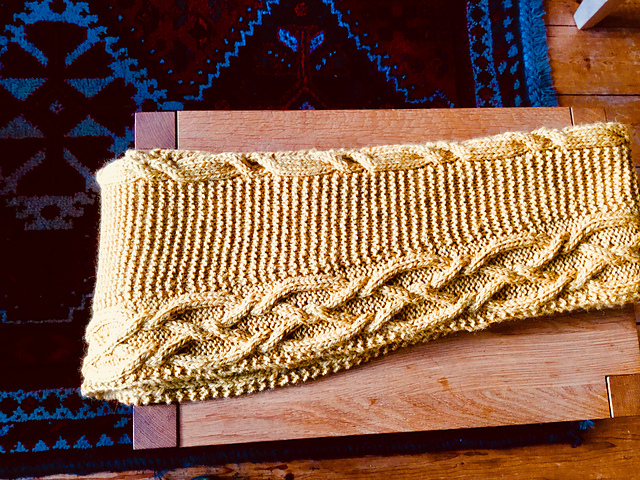 September’s pattern was the Wood Warbler Cowl by Martina Behm, which gave us a chance to practice garter stitch grafting. Martina’s clever cowl begins with a provisional cast on (building on skills learned in August) and had many of us wondering how the rather funnily shaped flat piece was going to resolve itself into a cowl. Brenda’s (McBrenda) Wood Warbler pre-grafting. Brenda had good fun “bossing” around three different yarns to achieve her lovely version. You can find full details on her Ravelry project page. Anne (amaknitter) knit her Wood Warbler in shades 2202 and 2135. 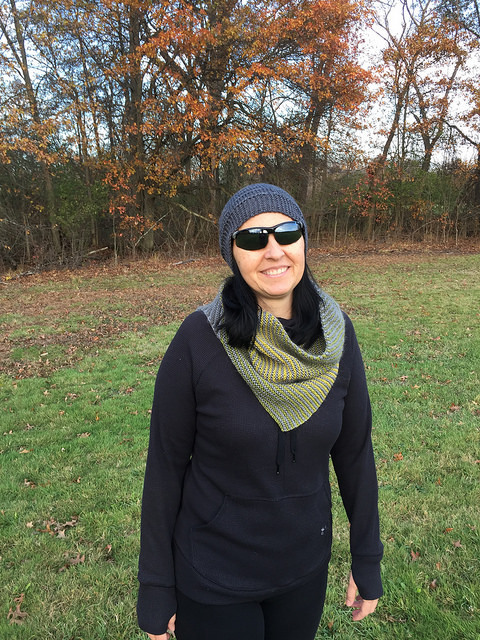 She actually knit the cowl twice after deciding she wanted her gradients to align in a different way — the gorgeous end result was worth the effort, I’d say! Julie (crochet-julie) has such a way with colour! Claire’s (soupdragon) wonderfully neat cables! Kyle’s (haliankcb) dog is a very obliging model! These are just a few of the great projects inspired by the Autumn techniques. If you’re after some inspiration, do have a browse of the projects on Ravelry — you’ll not only find beautiful finished objects, but also excellent project notes that are testament to the learning that happened back in Fall 2017! The Autumn video tutorials are all, of course, still available. And if you fancy learning something new and getting a warm neck in the process, we’ve still got Yellow Wagtail Scarf kits and Wood Warbler Cowl kits in the shop — though they’ll be retired next month to make way for new A Year of Techniques kits! If you’ve had your eye on the Ruschia hat, we have just a few skeins of Fyberspates Scrumptious Aran in select colours left (on sale to boot! ), or I think it’d also look stunning in a cheery skein of Something to Knit with Aran!